In honor of Earth Day coming and going, I’d like to take a moment to examine the age-old debate of e-books vs traditional paper books. The approach I am going to take is strictly from a reader point of view and while this post is 100% my opinion on the matter, I certainly welcome a counter point, so if you are interested in debating the other side of the coin, please reach out or link this post to your own blog and we will do so in kind. We are in the digital age and I think the last true remnant of literature in the previous age is the printed book. There are billions of them already out there and the publishing industry is still ready and willing to provide more to the marketplace. But just because the printed book is available, is it appropriate? To me the printed book serves a few purposes and the first of those is that it can most certainly be treated as a collector’s item. 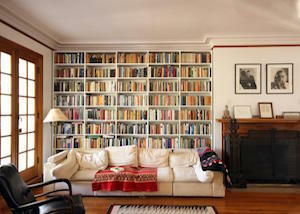 Storing and displaying of the books that you hold dear can say a lot about a person and I think there is some validity in this practice, so much so that some folks are die-hard book purchases for this very reason. Print books also allow the author to wow you with style. This could be a fancy cover that doesn’t quite translate to digital (read: Glitter). It could even be a certain size and shape of a book. In this point I think children’s books almost always make the case to be a print version, the opportunities are endless and a pop-up book is an impossibility digitally. Another pro for Print is that it keeps the public libraries accessible. 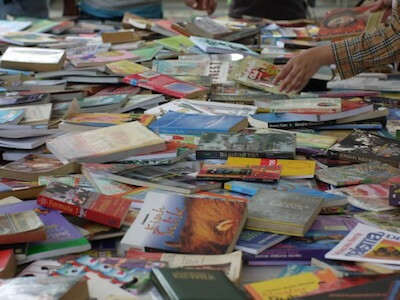 You don’t need to have a tablet or e-reader (though you can) to reap the rewards of publicly available book storehouses. Where printed books lose steam for me and where e-books become the method of choice is in the form factor and portability. Of course I can take a printed book with me anywhere, so they are portable, but e-books allow me to bring ten books with me and let me read them from a variety of sources as is convenient to me. I can read from my phone, my laptop, my kindle all without losing my page. With a printed book, I have to make sure I have it with me, make sure my daughter doesn’t pluck my bookmark out and also limits my ability to discreetly read in situations where it may not be regarded (read: work, soccer practice, my in-laws house). Another great thing that is now possible while reading digitally is the one handed read. 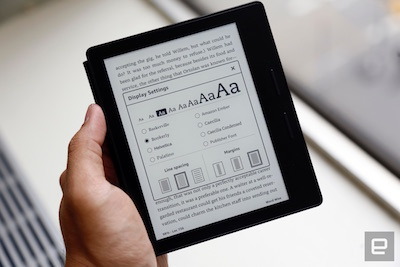 Kindles and smart phones are so svelte now that it allows you to read and swipe pages using just one hand. It also makes things far more comfortable for the times when I want to read laying down. A traditional book is heavier and turning the pages is often a pain. Look I’m not trying to tell you buying a printed book is wrong, I’m just saying that reading one is no longer the optimum experience. It’s hard to argue against that (and the smell of real paper only gets you so far). I don’t buy paper books anymore, unless I am buying books for my kids. I don’t like reading them and only will in the case that an e-book is not available. That being said, I am grateful that we have a choice. The last thing I want to do is alienate potential readers, because at the end of the day that is what it is all about, reaching more people. Where do you stand on the topic? I’d love to hear you make the case as to why you read one way or the other. Is there something that you wish existed that doesn’t yet? Let me know in the comments!